Feeling overwhelmed in a new house surrounded by a barren landscape can seem dismal and daunting? To get the ball rolling and move toward the landscape of your dreams start the process quickly on paper. 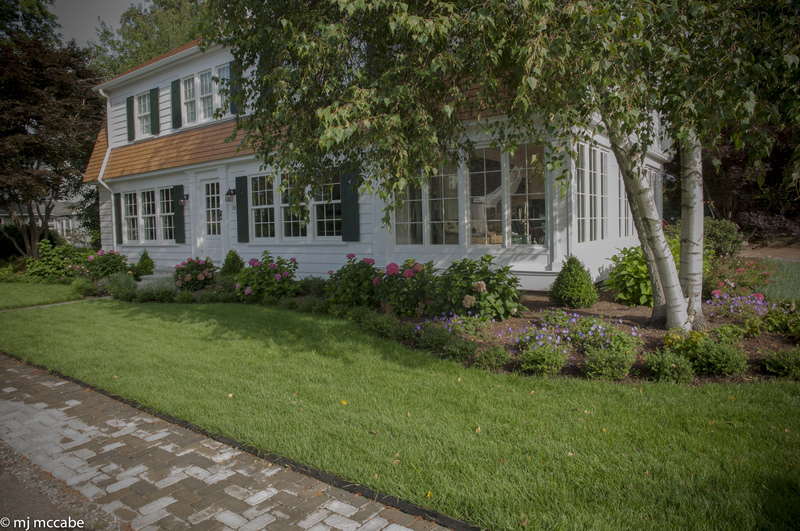 Start by creating a simple plan for your landscape on graph paper. 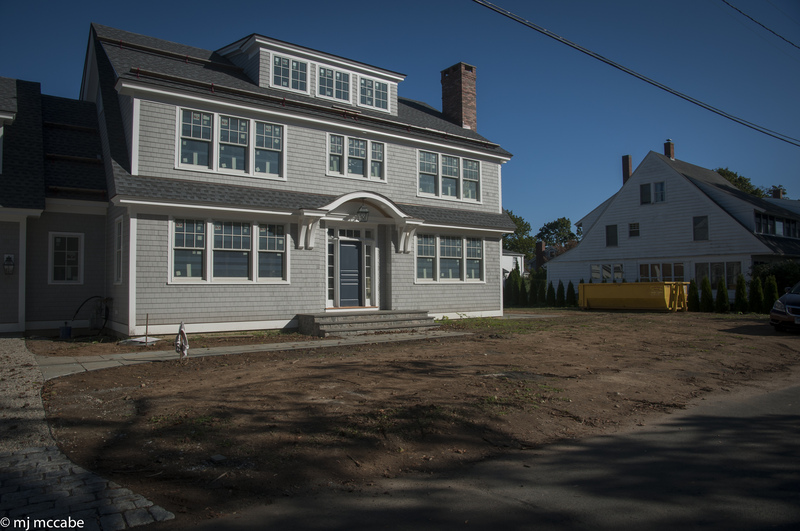 You do not have to be artistic to make a basic layout – the first step is to establish your property lines, put in any significant trees and utility boxes, Include the footprint of the house within this framework. A plot plan is usually available through your local town hall. This can save a lot of time with hand measuring and can be enlarged to make a good base drawing. Try to be as accurate as possible, using one square foot of space for each square on your graph paper. 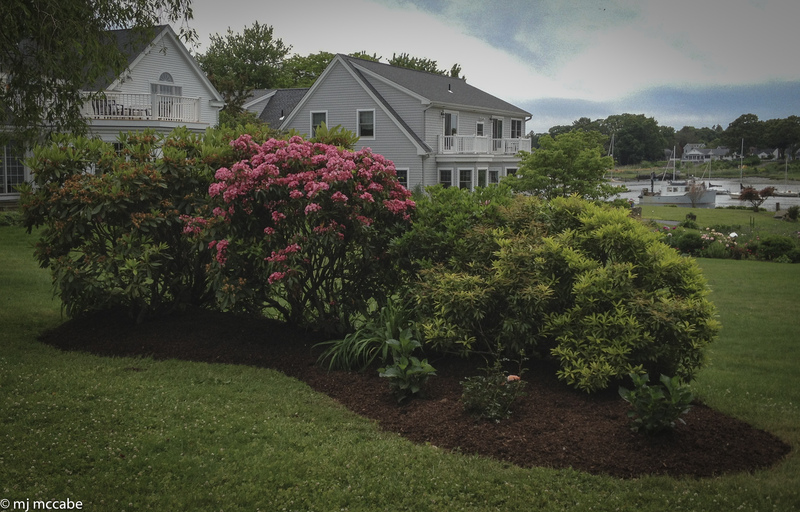 Add any significant existing elements such as walkways, decks, patios, trees or shrubs. A copy shop can enlarge your plan so it will be easier to work with. Once the basic design is on paper, the whole site can be viewed from a fresh perspective. Differing shapes and proportions will start to emerge as you start to see both the positive and negative aspects of your site. Your goal will be to enhance and embellish those positive elements and lessen or camouflage the negative elements. 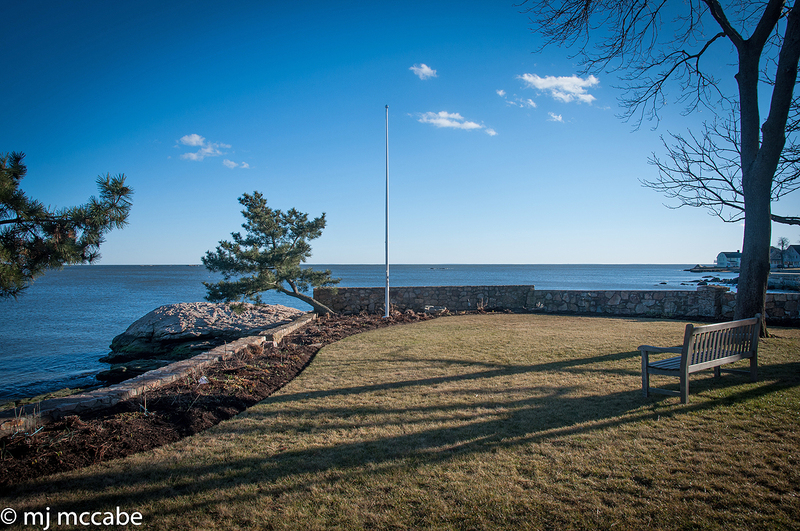 When applying a simple geometry to our home landscapes, boundaries are delineated, potential screening borders are defined and areas for shade providing trees becomes more apparent. Avoid turning large areas into water demanding lawns-this only reinforces the redundant use of wall-to-wall green carpets of grass. An American cliché that needs to change if we are to support self-sustaining, healthy landscapes devoid of chemical dependency. 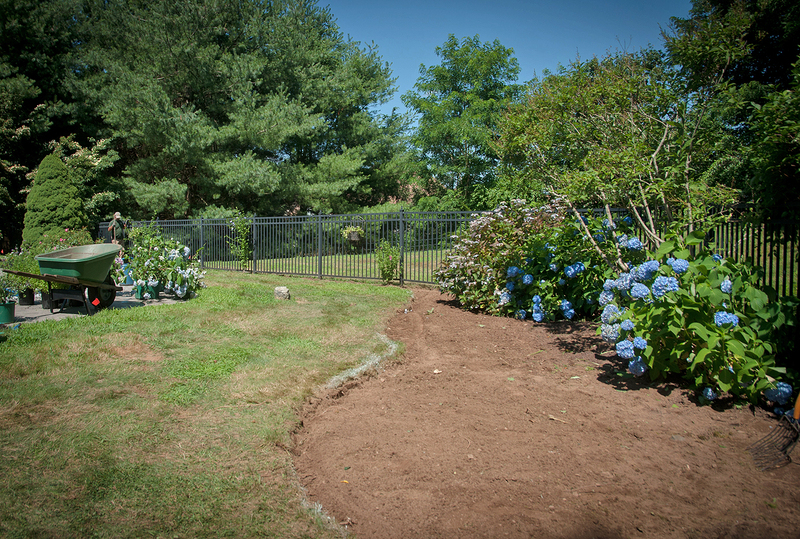 Select shrubs such as abelia, deutzia, itea, Lespedeza and viburnums because they bloom at different times in the season- interplant with ornamental grasses and native perennials to break up large areas. 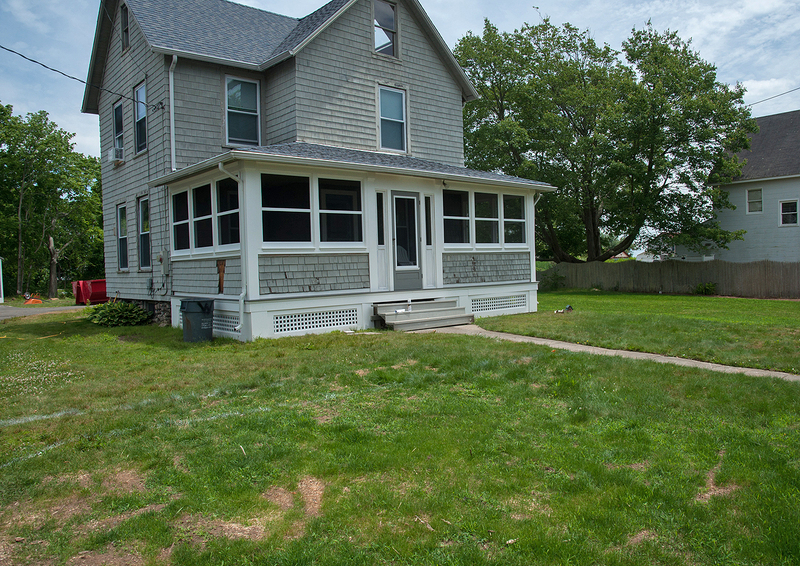 To offset these beds, consider using grass as more of a visual “scatter rug” that links one area to another. 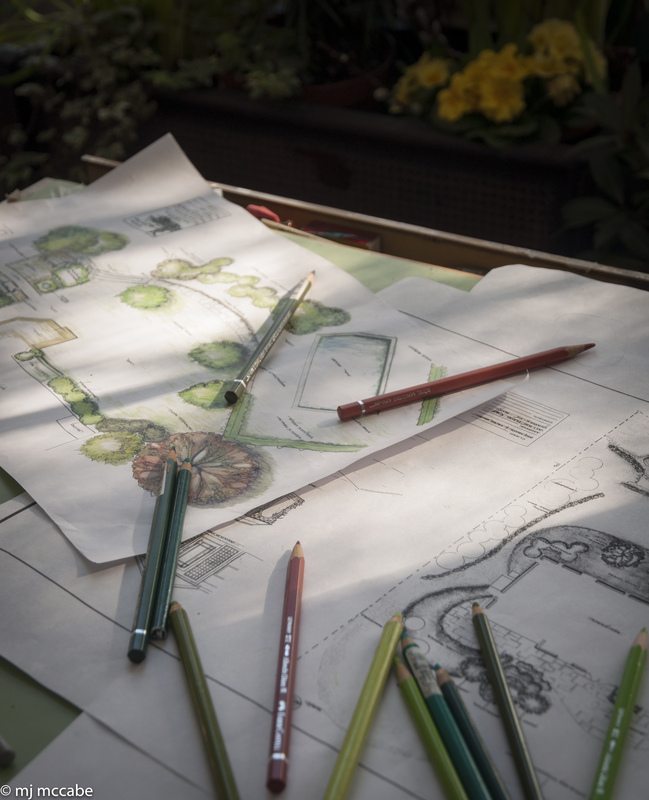 Working in this way, creates more fluidity and spontaneity in the landscape-while creating separate and perhaps more intimate areas in your garden. For example, strategically placed flowering trees may define where a pathway starts as well as eventually add a nice canopy of shade. The verticality of trees brings the scale of the house down while adding a cohesiveness to the overall landscape. Aim to select a palette of plants that complement each other-it is better to choose a limited amount of varieties that blend and reinforce each other in terms of bloom sequence, form and texture. Filling a border as well as the overall landscape with too many differing varieties creates a chaotic look – giving an unsettling and even conflicting relationship with the architecture of the house. 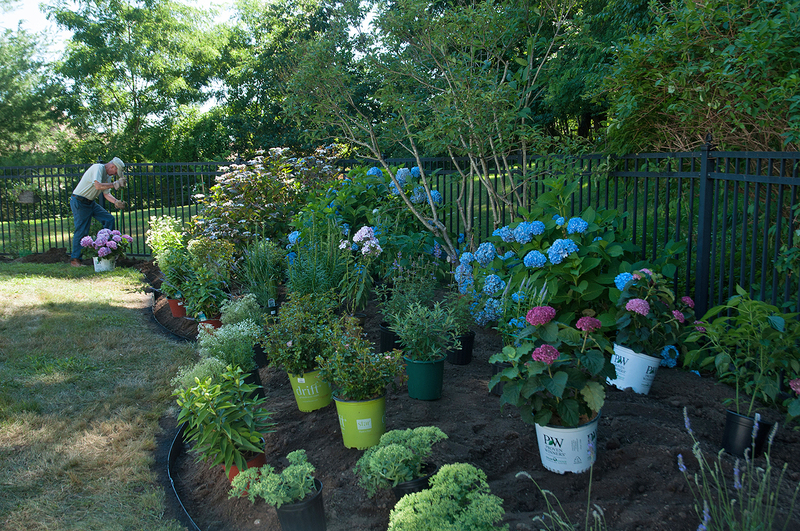 The plant selection should enhance, echo and lend a sense of continuity to the lines of the house. Good plant selection along with well-designed hardscaping will anchor the house to the site providing a sense of coherence and stability. This is especially important when working with a new home. 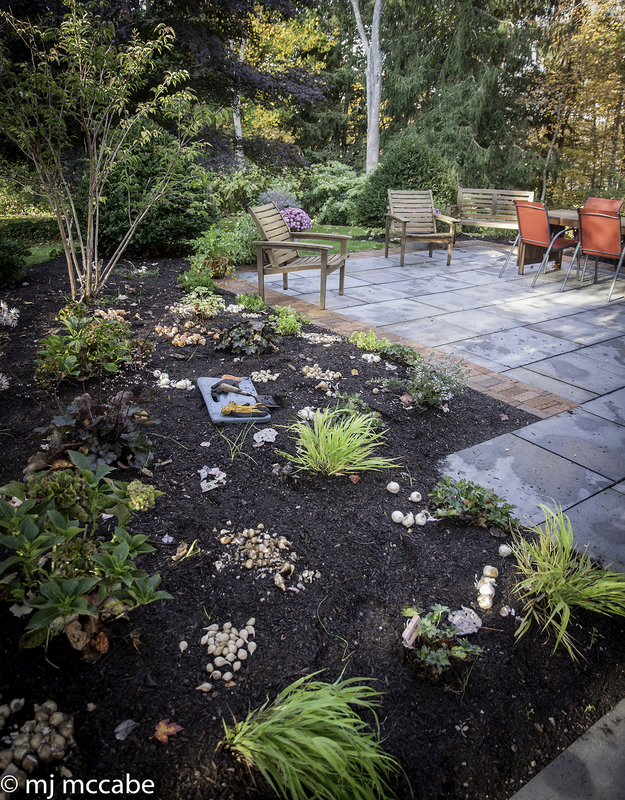 Understanding and appreciation of the style of your home is vital to creating a landscape plan that marries the hardscaping to the plantings. 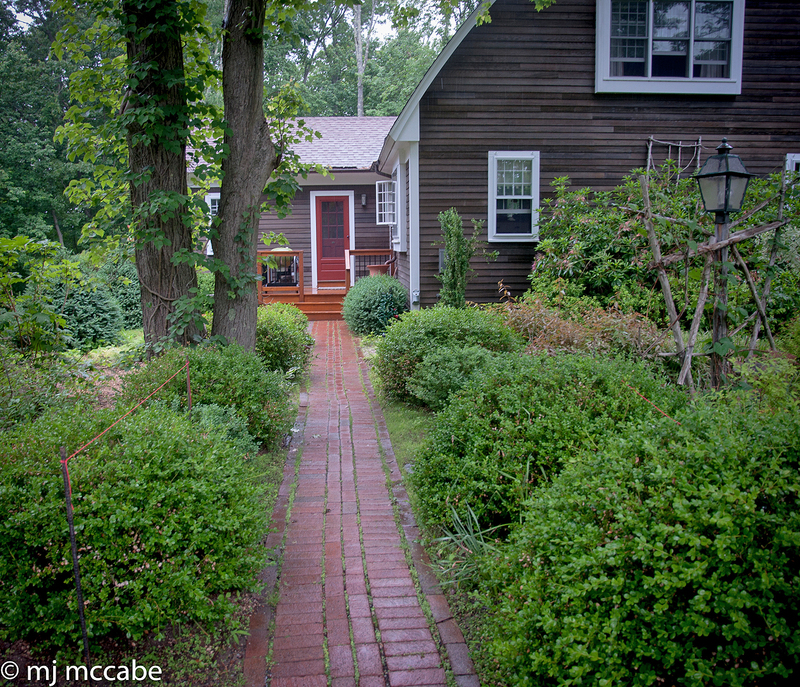 An orderly Cape Cod home works well with a curving brick walk that is edged with lush perennial beds. A more contemporary home may lend itself to large irregular stones laid in sweeping patterns that echo the lines of the home. 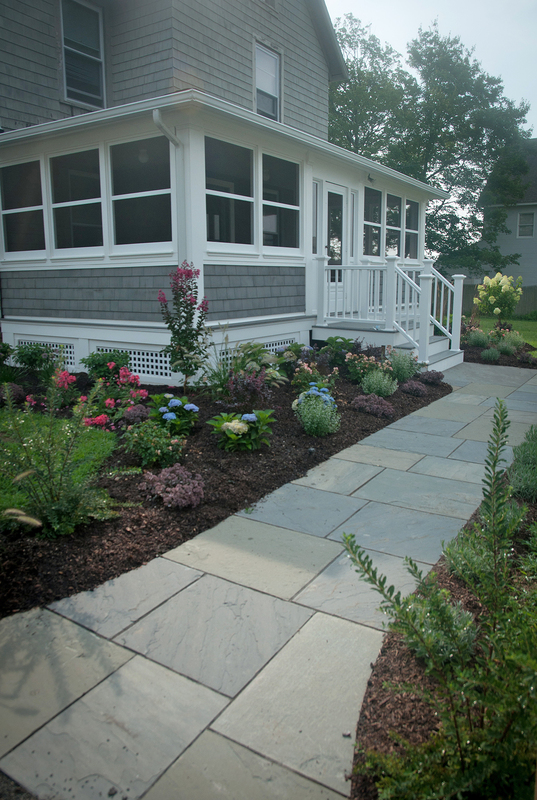 A wide curving path with planting beds on both sides will soften the long, horizontal lines of a ranch house. 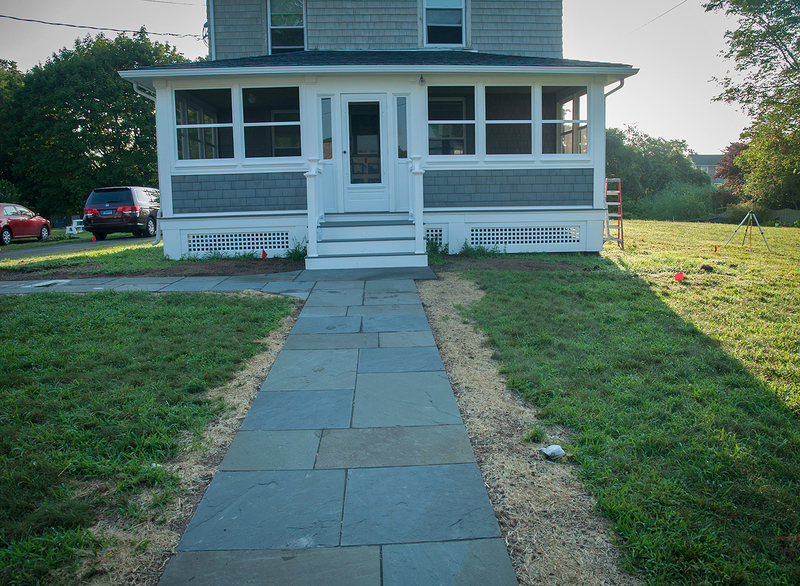 Straight somewhat geometric stone patterns can work well with the clean linear lines of an early 1900s home. 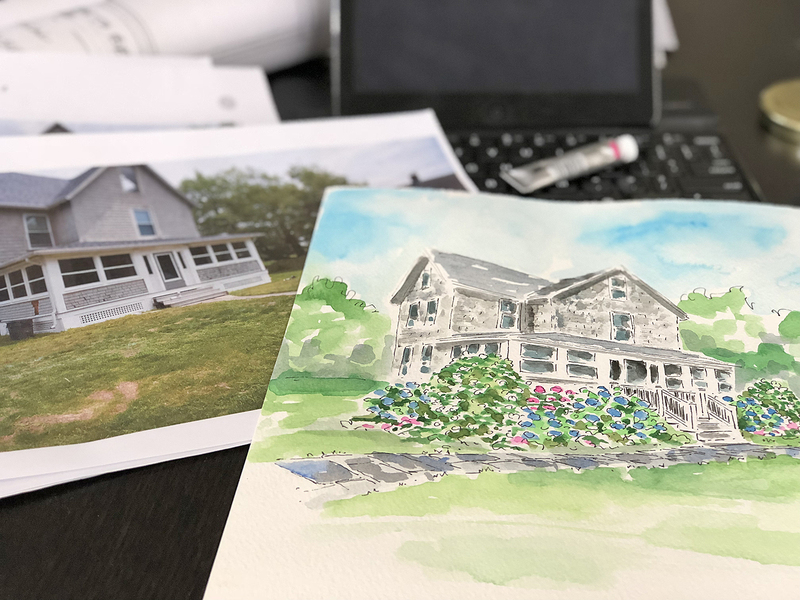 Patterns, motifs and prominent feature of the house in the form of roof lines arched windows or ornate entrances can be clues to connecting the walkway to the house as well as creating a pathway that flows and encompasses the rest of the landscape. 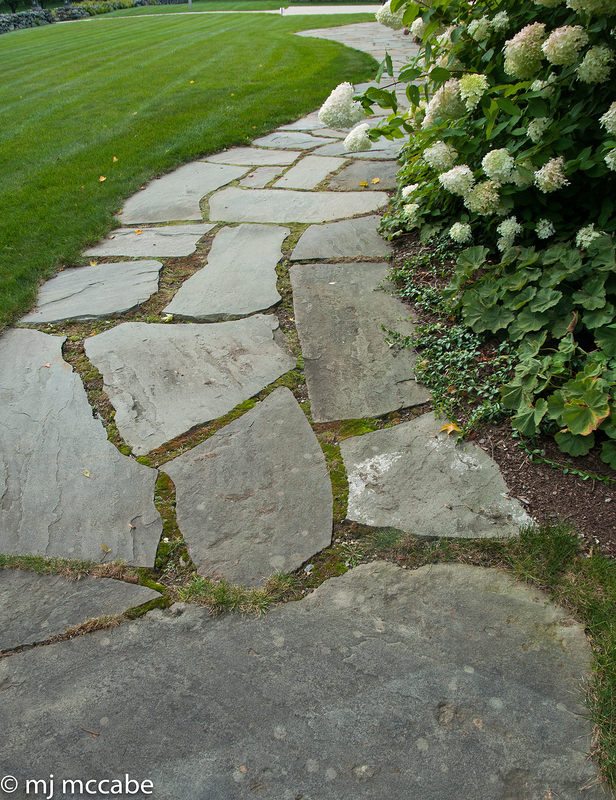 For instance, a repeating path from one doorway should lead seamlessly into a back patio or deck. Aim to address the hardscape first. Specifically the main walkway from the driveway to the front door keeping in mind the potential for patios, decks and other walkways that may be added later. 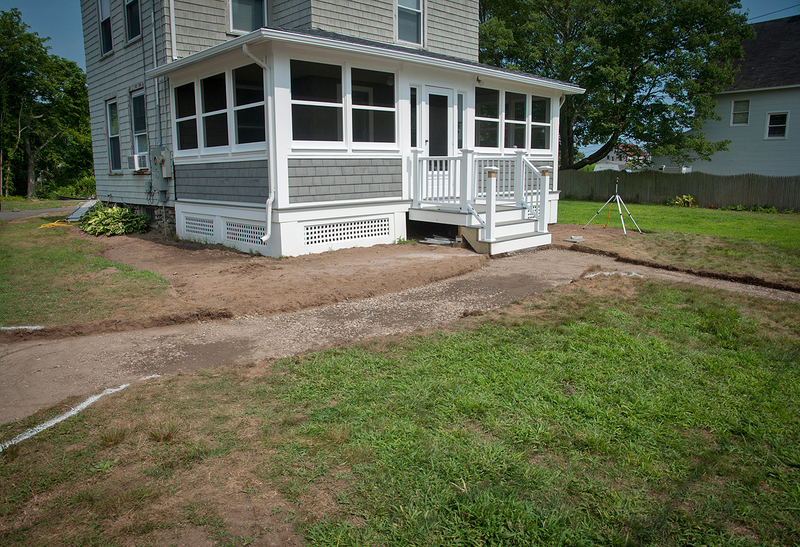 If the contractor has left you with an uninspired straight and narrow walk that goes from the drive to the front door, consider rethinking the walkway and making it at least 4′ wide. 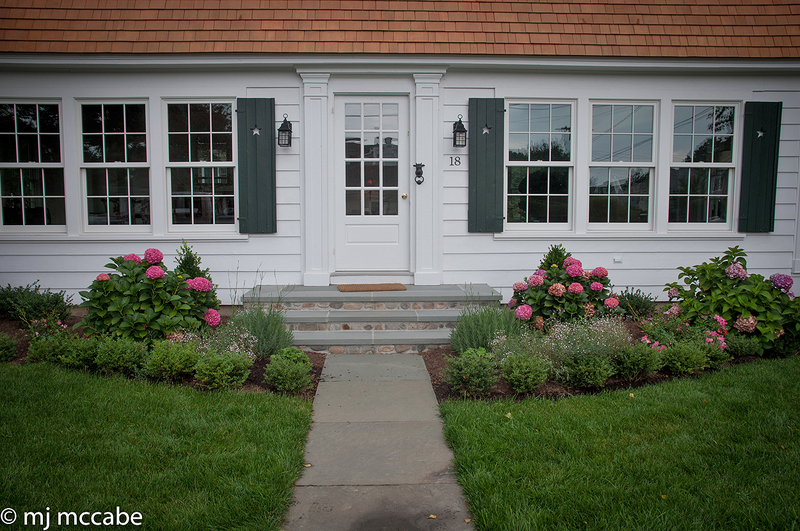 Adding curves will add some drama and make the walk to your front door more visually interesting. A gracious wide walkway with some gentle curves will also suggest areas for interesting planting beds that will add interest and a strong visual appeal to the house. 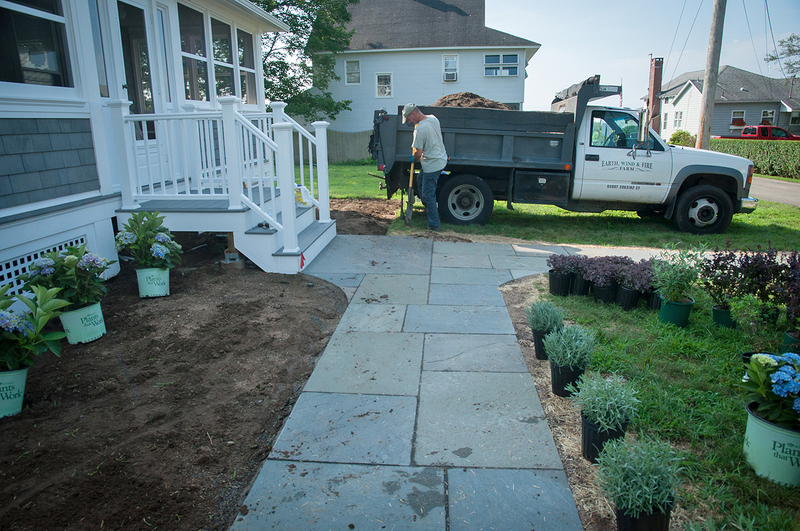 Unifying the plantings and the walkways together provide a strong underpinning that will give the house a more finished look. 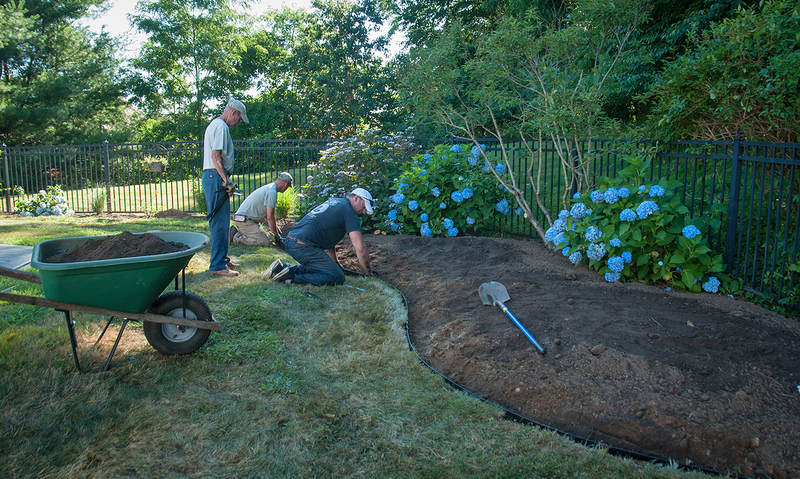 When creating a planting border against the foundation of the house, aim to create borders that are 8-12′ deep which will provide for a multilayered planting bed. 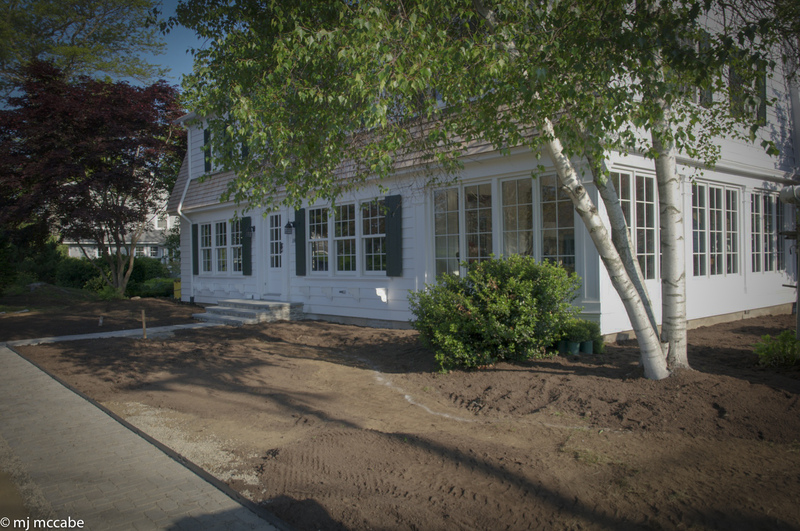 Also, avoid planting too close to the foundation-a good rule is to plant shrubs about 2-3′ away from the house. 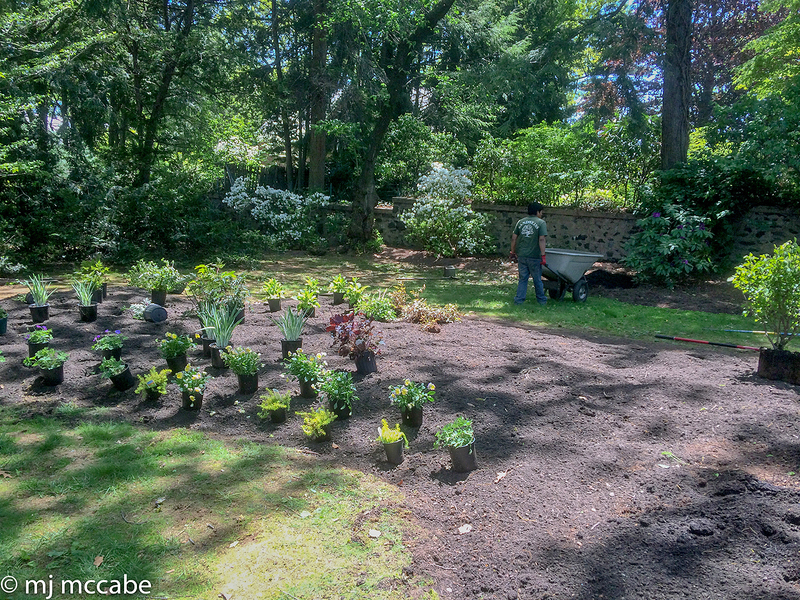 Deep beds allow you to be able to select many more interesting plants that will allow for a beautiful succession of blooms. 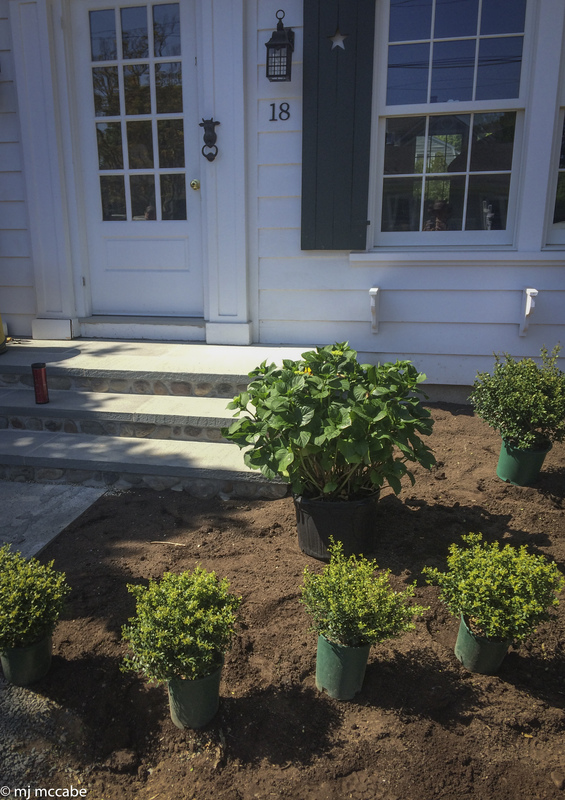 If a cement foundation is unsightly, a solid line of low growing evergreens such as Ilex crenata ‘compacta’ is a good selection that will not only camouflage the foundation but also act as a nice backdrop for flowering shrubs planted in front. Select compact and hardy shrubs that will provide a consistent progression of flowering from Spring to Autumn. 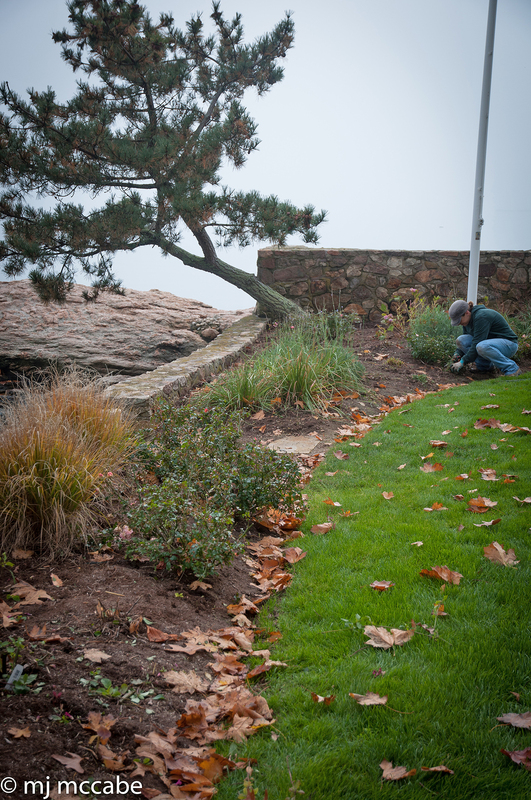 Aim to create a border that will have a graduated look in terms of height, balance and form. 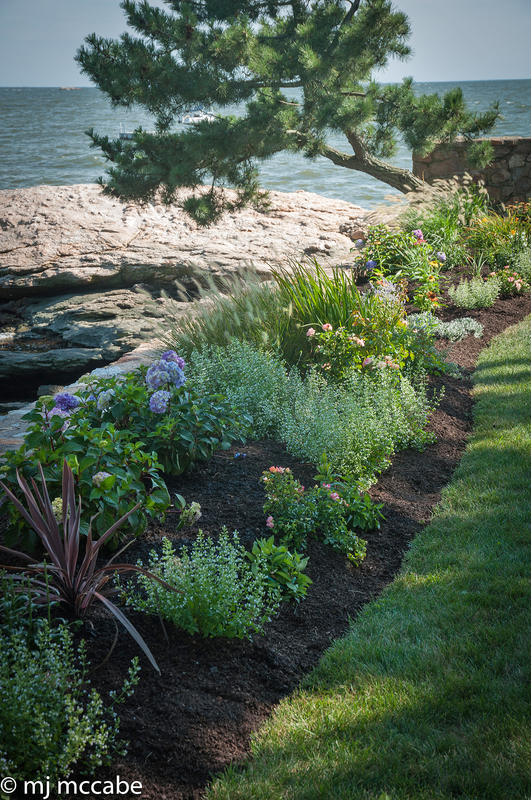 Embellish the front of your border with long blooming perennials and sweeping ground covers. Low growing Spring bulbs can be added between the ground covers to create additional color in early Spring before anything else is in bloom. Walkways should be about 4-6′ wide to accommodate 2 people walking side by side. 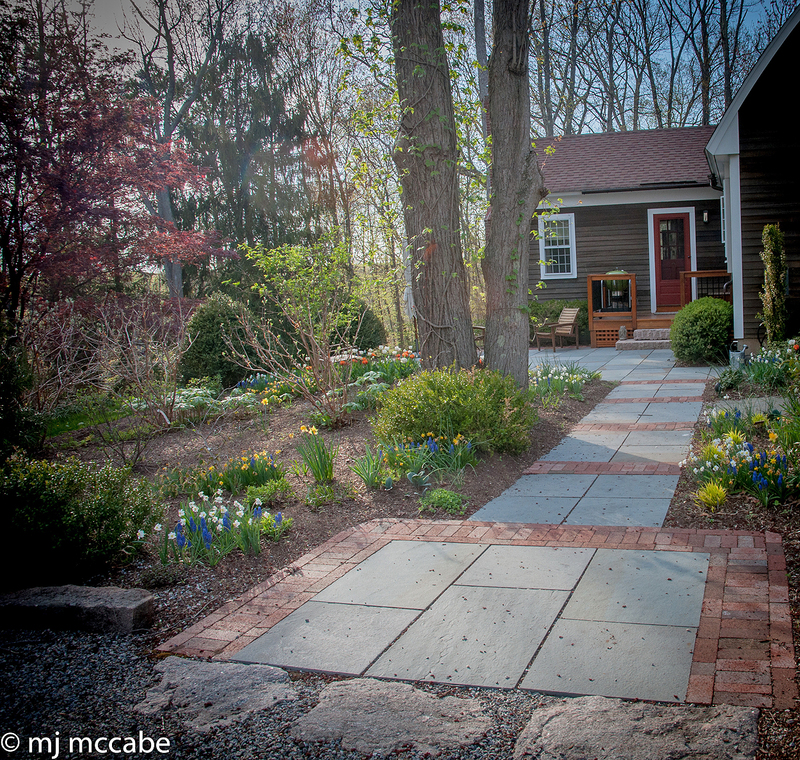 Pathways that are generous in size and well-organized are always inviting for visitors. 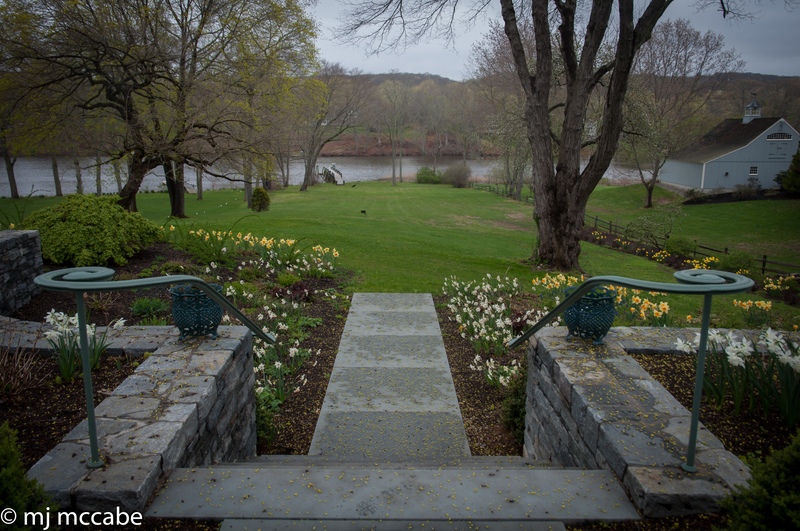 Stone curbing with grass risers makes a gentle transition for one part of the garden into another part of this expansive garden–the sweeping views allows for a majestic vista of the upper garden. A private patio reprieve tucked next to a garden shed–a special feature that is hidden from the overall garden making it secretive and private for early morning coffee and good conversation. 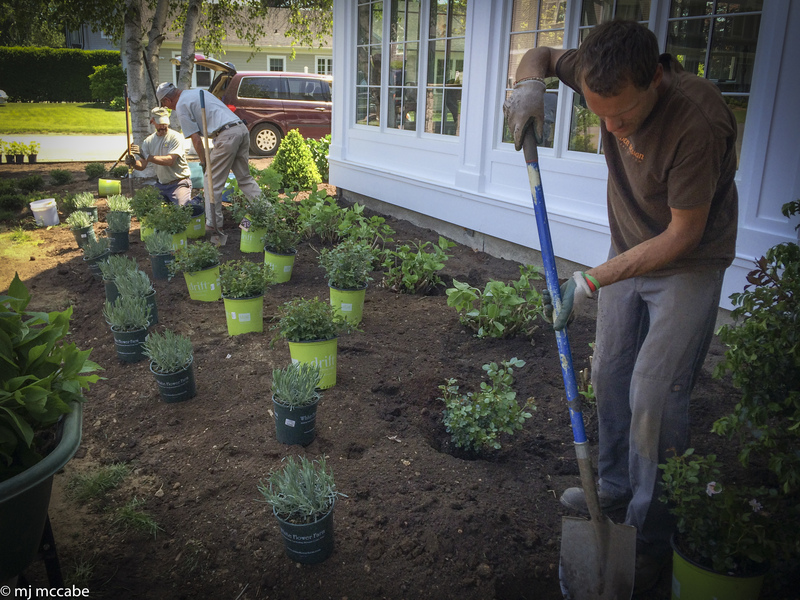 Boxwood shrubs create a nice backdrop for lower growing plants–Steps onto a patio make the space more expansive and inviting. 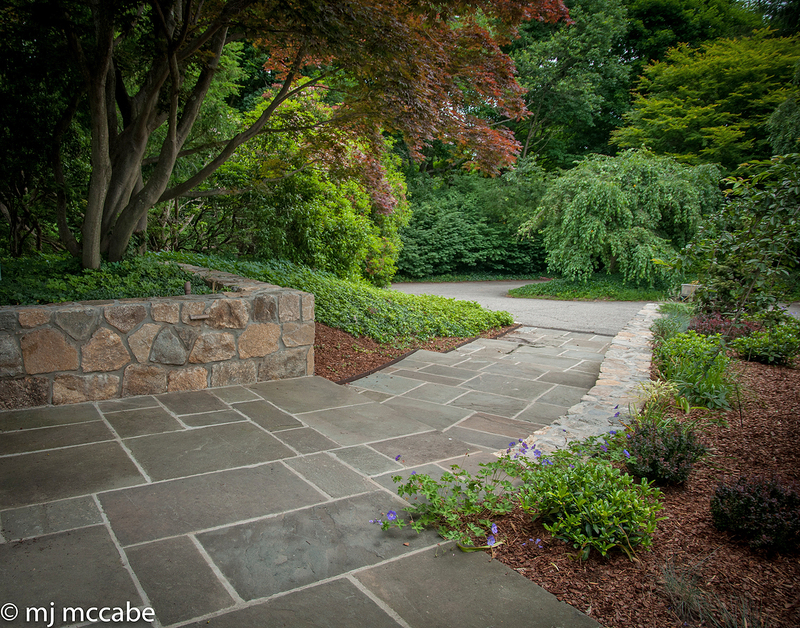 This bluestone and brick walkway leads effortlessly onto a generous patio as well as the main entrance. Early bulbs are much smaller and will do well planted about 3-4” deep. Top dressing with an autumn mulch keeps the ground warmer allowing for root development before the deep cold of winter sets in. This insulating mulch also protects the bulbs from quick freezes and thaws that often occur in late winter. 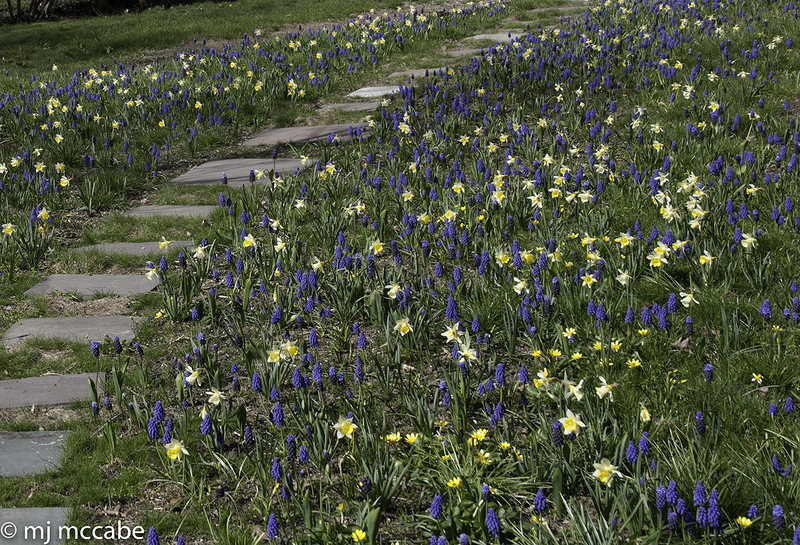 A generous mix of bulbs are being incorporated into any existing garden. 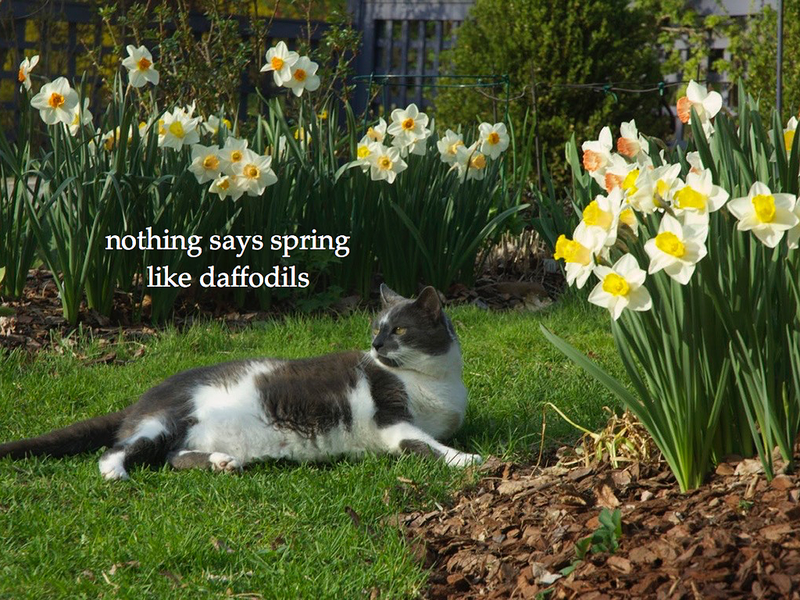 As the days become longer and the daytime temperatures gradually rise, the bulbs will naturally begin to emerge and start the wonderful process of sequential blooming. Since the early spring bulbs are low growing and devoid of a lot of foliage, the first flush of flowers magically appears making the early spring garden abundant in a sea of blooms–creating a breathtaking picture that can last for several days of even weeks. When one group of bulbs start to fade, another grouping takes center stage quickly filling in any vacancies in the garden. After flowering, it is important to give them a feeding of organic fertilizer and allow the foliage to die back gradually. Later bloomers like tulips and alliums along with emerging perennials will eventually camouflage the waning bulbs. By creating a design that promotes a progression of bulbs, the garden will never be without something in bloom. 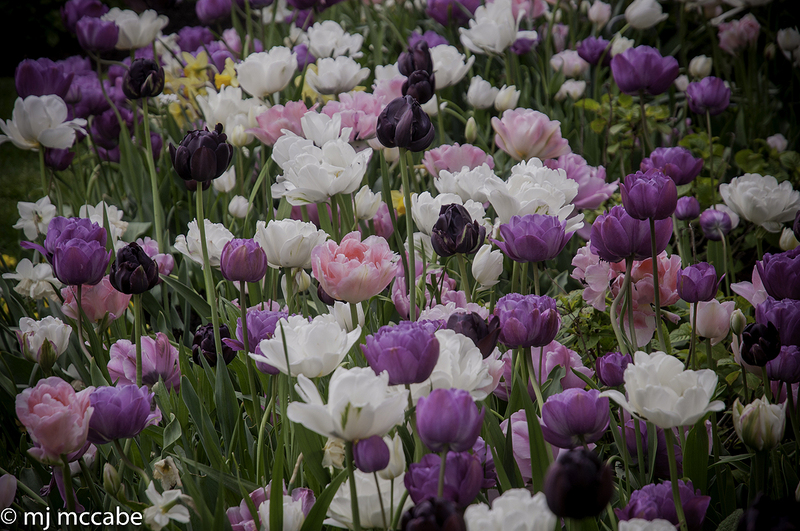 In late April and early May, tulips the grand-dames of the garden lend flirt and fancy in an abundant array of colors and shapes. 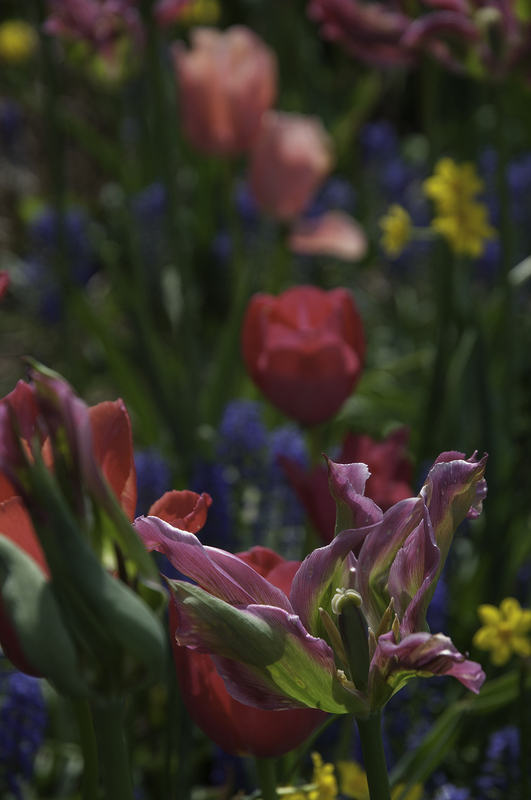 Species tulips are tiny in size often blooming along with daffodils which makes them less likely to be eaten by deer. To deter rodents from eating the bulbs, use a rodent repellant or add cayenne pepper or garlic flakes to the planting hole. 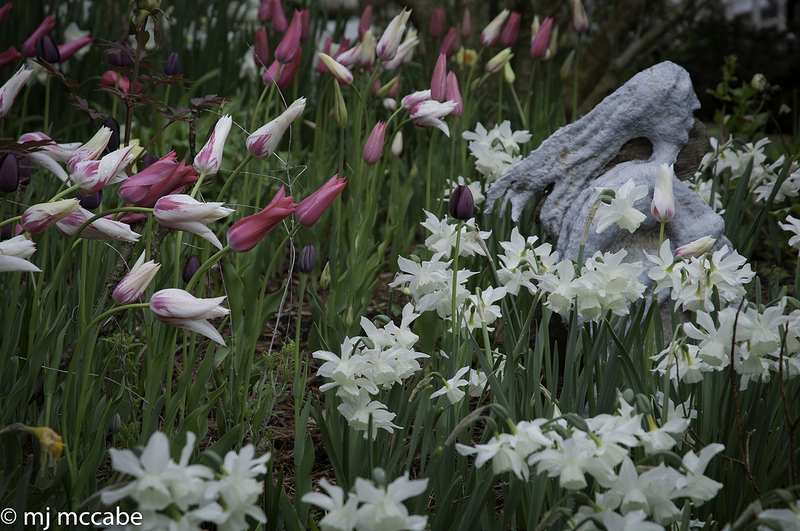 Spring bulbs in a sculpture garden. Another trick is to spray bulbs (especially tulips) with a diluted solution of old fashioned liquid lysol and let the bulbs dry completely in the sun prior to planting, The offending critters are hindered by the smell and taste of this strong smelling cleaner. 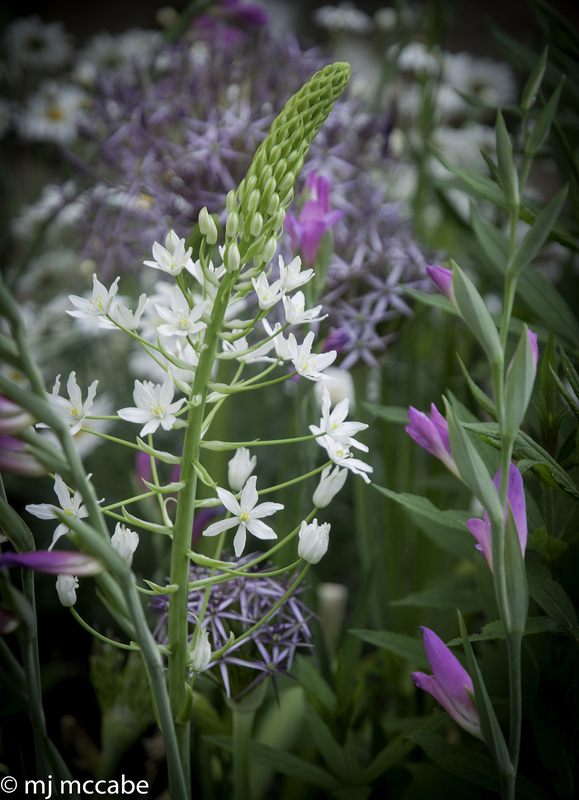 Another tip from a bulb importer is to plant them in the same hole as the allium. The strong onion odor of the allium helps to keep critters away as well. The dynamic and vertical lines of flowering onions or Alliums continue the show into June- globe-like flower of the allium may be allowed to dry in the garden, which adds texture and interest to your perennial borders. There is a multitude of allium varieties in the market–from very low growing to impressive 4‘ varieties. Alliums add an elegance and dramatic verticality to the late May and early June garden Fragrant and dramatic lilies, “the wings of the garden” take flight in late June and July. You can find a multitude of different hybrids in dazzling colors and shapes in all of these species of bulbs. 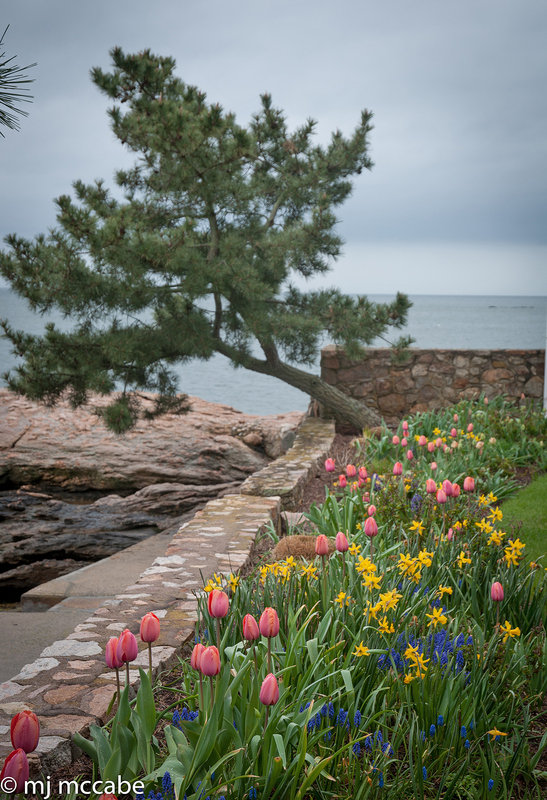 An enchanting collection of peony-flowering tulips and late daffodils in a seaside garden. To encourage your bulb garden to flourish, select a site that has well-drained soil. 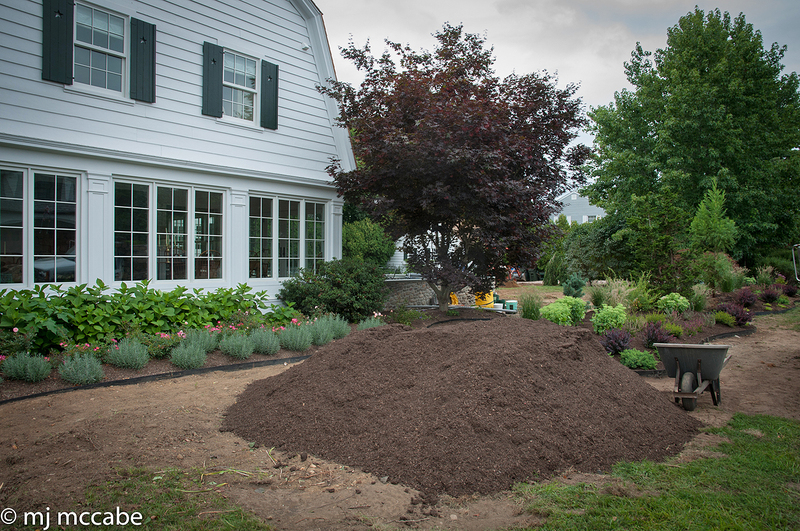 If the soil needs work, start by enriching the proposed area with good top soil or compost to a depth of about 6”. Bulbs do not like to be planted in area that is usually wet–so good drainage is essential when preparing your site for a bulb garden. Plant bulbs with the pointed side up adding a tablespoon or so of an organic fertilizer that contains rock phosphate, which will ensure proper root development. It is especially important to plant the bulb to the proper depth which is about 3-4 times the bulb’s length. For example, a tulip which is about 2” long needs to be planted about 6-8” deep. The earlier bulbs are much smaller and will do well planted about 3-4” deep. Top dressing with an autumn mulch keeps the ground warmer allowing for root development before the deep cold of winter sets in. This insulating mulch also protects the bulbs from lifting when quick freezes and thaws occur in late winter. 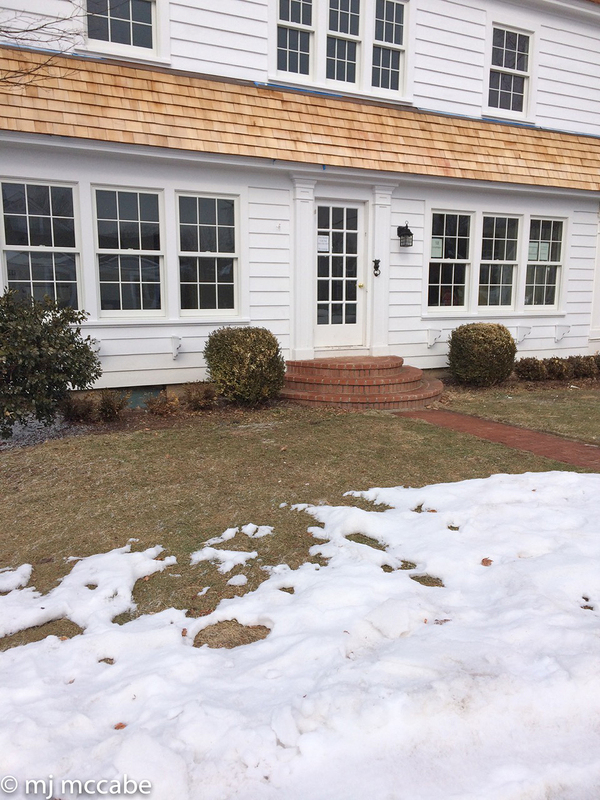 As the days become longer and the daytime temperatures get warmer, the bulbs will naturally begin to emerge and start the wonderful process of sequential blooming. When one group of bulbs start to fade, another grouping starts to take center stage and fills in any vacancies in the garden. Since the early spring bulbs are low growing and devoid of a lot of foliage, the flowers in full bloom appear as luscious masses of color–creating a breathtaking picture that can last for several days of even weeks. After flowering, it is important to give your bulbs a feeding of organic fertilizer because this is the time they are storing food for next year’s blooms. Always allow the foliage to gradually die back naturally. By late June most of the foliage has completely withered and can then be safely cut down. Later bloomers like tulips and alliums along with emerging perennials will eventually camouflage the waning bulbs. By creating a design that promotes a progression of bulbs, the garden will never be without something in bloom. At present, bulb supplies are still plentiful and you can safely plant your bulb garden right up to Thanksgiving. A warm sunny afternoon in late October or early November is the perfect time to plant your spring garden–so don’t hesitate to get out there soon! 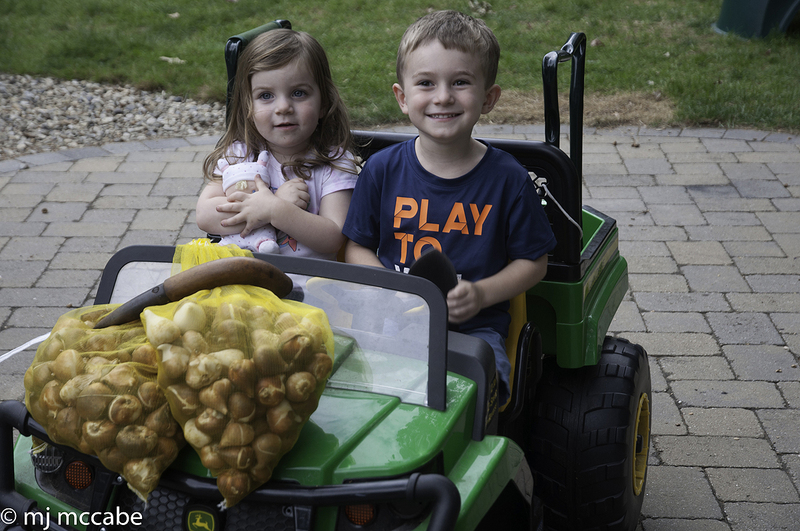 You’re never too young to learn how to plant bulbs for the family garden! 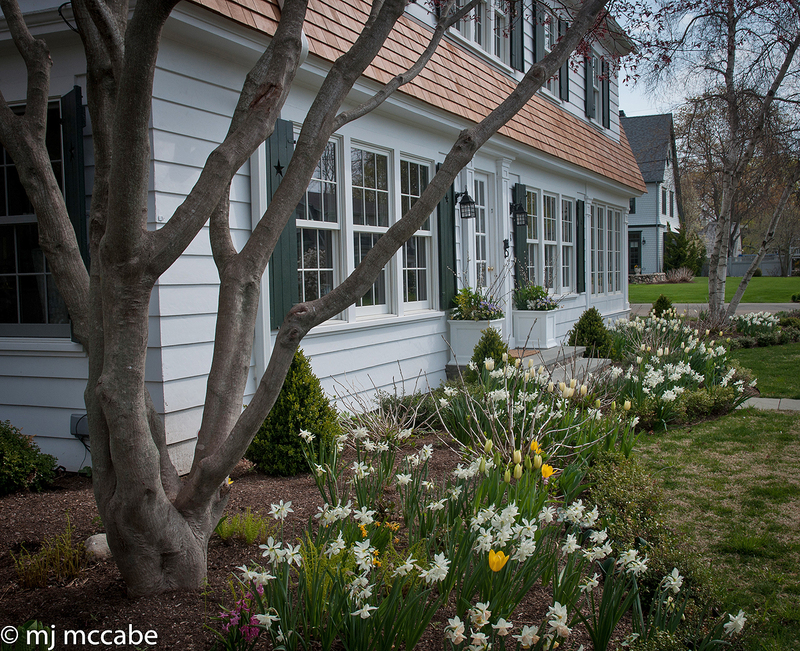 I never feel a perennial garden is complete without the addition of spring bulbs. The wonderful serendipitous quality of bulbs make the early spring garden truly come alive — a vivid reminder that we can bid adieu to the long cold and grey of winter. Whether you are just a beginner or a more seasoned gardener nothing will feed your soul more than a fabulous display of spring bulbs. Planted en masse, the luscious colors, subtle fragrances and long blooming flowers creates a wonderful prelude for the unfolding spring season. A carefully selected collection of spring bulbs will provide a symphony of successive blooms that will enliven your garden with many months of amazing color and fragrance. By incorporating a mix of early, middle and late blooming bulbs, you are ensured of a display that will span several months. The early bloomers of March and April are snowdrops, crocus, Iris reticulata, Scilla, Chionodoxa followed by daffodils and hyacinths. With careful planning now, the entire month of April can be a spectacular display of flowering bulbs in a multitude of forms and a rainbow of colors. Pure white cosmos is enlivened by a backdrop of silver sage. ‘Sheffield’ Mum one of the last perennials to bloom in the October garden has lovely peach colored flowers. Late blooming hydrangea paniculata in shades of ivory and pearly pinks are a lovely contrast to an enclosed boxwood garden. The plumes of the Miscanthus grass echo the beautiful trunks of the white birches. Late blooming asters add sparkle and pastel colors in the October garden. The brilliant color along with the fabulous form of Japanese maples lend a glorious canopy to the autumn garden. Peach colored lantana curls around Salvia van houtii to create a lovely autumn marriage. Fothergilla is an amazing shrub that turns into glorious color in the fall. 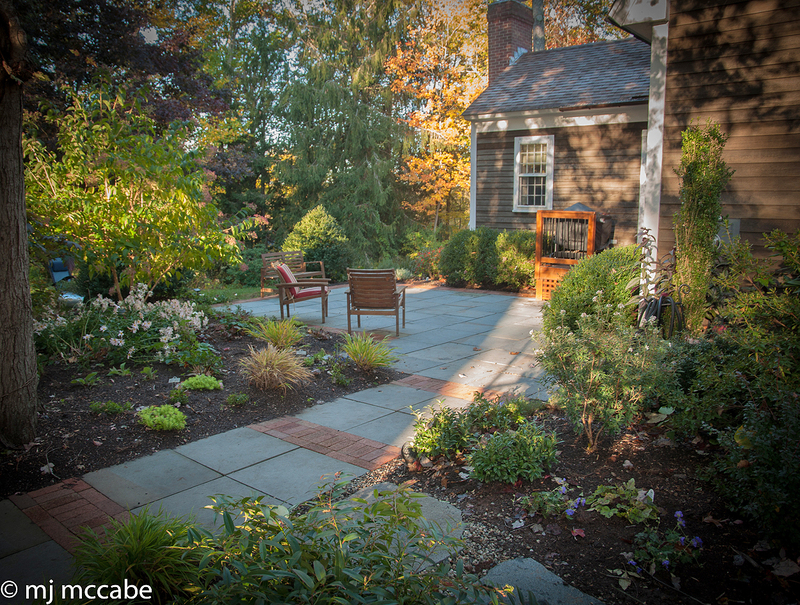 A mass planting of fountain grass brings a dynamic play to the fall garden. Persicaria ‘Fire Tail’–blooms for several weeks –adding a nice vertical accent in the garden. A late blooming dwarf hydrangea-the perfect addition to the smaller garden. Colchicums appear magically in the October garden–a perfect complement to autumn mums and asters.